A couple weeks ago I finally got a VR development machine up and running again. One of the first experiences I tried was the popular From Ashes. While overall I found it tedious, annoying, and ugly, one moment stuck out for me as imaginative. The narrator of the program, TV Head, has an old-timey television set for a head (and is a floating torso with arms, otherwise), and toward the end of the experience at one point he presents to you a separate television at your ever-present virtual desk. The catch is: the image it relays to you is not simply displayed on the surface of the TV; instead, the area inside this also-old-timey (read: not flat-screen) set is more like a hologram presenter. You don’t see things *on* this TV so much as *in* it. When you bob your head around, you get different angles on the three-dimensional objects presented. This led me to imagine an extension of this idea into its own aesthetic/discipline/medium. Suppose one wasn’t limited just to the area inside the TV set. Suppose the TV screen instead functioned as a rectangular portal into another world, as limitless in space as your own, which you could see through perfectly. Things you saw through it could be quite distant, so bobbing your head around could achieve some significant parallax. And things you saw through it could be quite close to the portal on the other side, just off the edges of the screen, and you could find them by getting right up to the screen on one side and looking through it nearly crossways. Furthermore, you could stitch together sequences of such portals just like a traditional film. One second the portal is right in a character’s face, a close-up, the next it’s a medium shot of their hands picking up a wand, the next it’s several hours later, a wide shot from across the street of them casting a spell on someone. I propose the name “fenestragraph” (fə ˈnɛ strə ˌgræf, sounds like “finesse” and “paragraph”) for this new medium, because it is essentially writing in windows. The value of this medium is that it carries some of the three-dimensionality of immersive cinema, while preserving the ability to edit shots together in a fairly strongly directed way. I am just referring to the well-known struggle we’re going through at this point in history with storytelling and attention-controlling in VR movies. 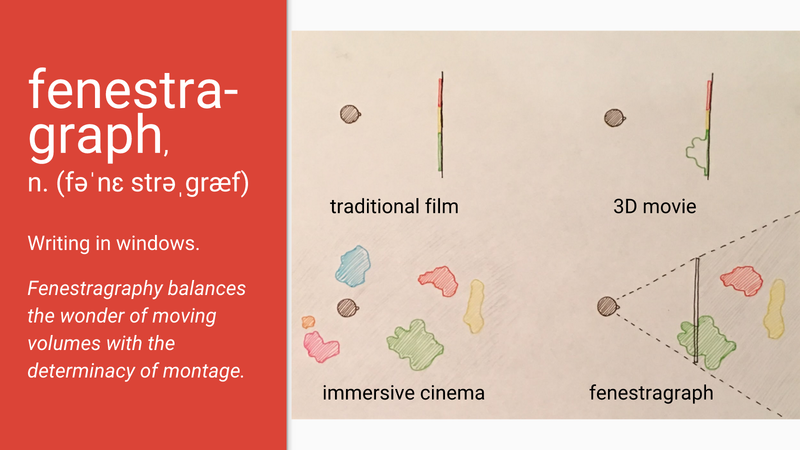 This medium is maybe even more like 3D movies than VR, the difference being that in 3D movies the 3D stuff merely seems to be 3D and comes out of the screen at you, whereas in fenestragraphy (ˌfɛ nə ˈstrɑ grə fi like “photography”, or ˌfɛ nə ˈstreɪ grə fi like “fragrance”) the 3D stuff is truly 3D and exists inside the screen. I am imagining this screen existing in VR, but you could even achieve this with a normal screen, as long as it was equipped with some head-tracking sensors around it to tell where you were relative to it so it’d know what to display. The only difference in this case would be that since the screen is physical instead of virtual, you wouldn’t be able to stick your head *into* the other world. (Whether or not authors of these types of experiences for VR would allow you poke your head through the portal [or once through, whether you’d be able to look back through or at things in the other world on the side 180 degrees from the direction it faces] would remain to be seen). As for sound, I imagine that it would be completely unrelated to the window. You’d hear everything in the world you were looking into, just as in immersive cinema. Only here, things to the sides and behind, while they’d sound like they were coming from where they were, would be unseen to you. You are currently reading fenestragraph at cmloegcmluin.